After 16 years with Vi(m), a week back I switched to Emacs as my primary editor. I used Emacs for a few days in 2010, when it was suggested to me by the #lisp channel. But, neither I continued, nor I understood the keystrokes well. I was trying out Org Mode in Vim. Looking at the strange key-combinations, I felt it is not for me. I decided to give Emacs a proper try for the first time. If you know about our summer training, or saw me discussing about GNU/Linux world in any college, you would have seen me to suggest vim to everyone as a starting point. Mostly because of two reasons. It is there on default Fedora installation. I still think it is easy enough for the beginners to start with. For me, to learn anything new, I prefer to use it regularly. Let it be a programming language, or a particular tool. I wanted to see how Org Mode works in Emacs, but, to do so well I had to use it myself. That also means I will have to use Emacs regularly. I used a few different sources to start reading, and also configuring my init.el file. Shakthi Kannan has some excellent articles on Emacs. I also found another site which introduces Emacs and related configurations well. I am going to suggest both sites to anyone starting with Emacs. Shakthi also has a very good reference card for the keystrokes. In the #dgplug IRC channel, maxking suggested to start using eshell and magit inside of Emacs. I am using the presentation from Shakthi to learn magit. The last few blog posts (including this one), and also a few commits in random places were done using this setup (inside of Emacs). I am not going to say this was very smooth. Remembering the keystrokes is always difficult. Getting them into the muscle memory is even more time consuming. But, there are few things which I found really difficult (for me). Sometimes I see the same buffer in two split areas, just can not close them easily. All the other regular Emacs users I know, are using it for more than 10 years. I am not trying to hurry, I will slowly learn the various facts and HOWTOs. 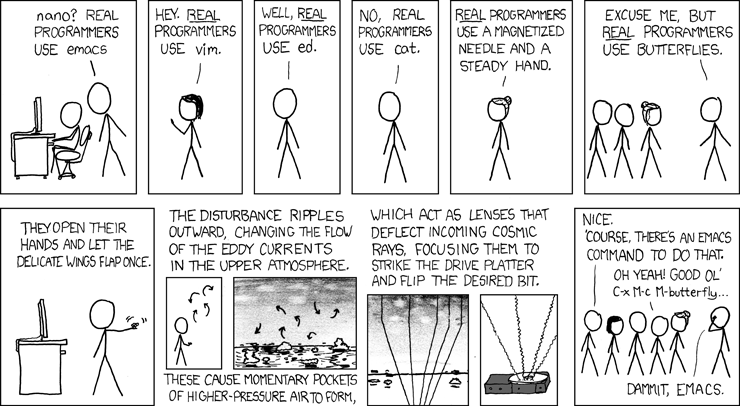 The famous XKCD post fits well in this regard.